I think Christina must have extended her PJ Party, too! Nah, she just works too hard! Let’s give this girl some love for always bringing it! Feel blessed to have you in my world little Miss WriteonRubee!! 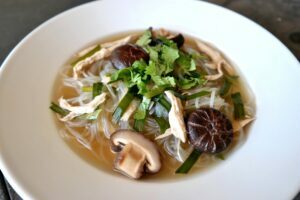 · Simmer stock with garlic and ginger and poach chicken until tender. Remove garlic and ginger. Remove chicken and shred. Set aside covered with a little broth so it doesn’t dry out. · While chicken is cooking, soak shiitake mushrooms in warm water for 15 minutes. Discard tough stems. Slice larger ones. · Soak noodles in warm water for 15 minutes or until softened. 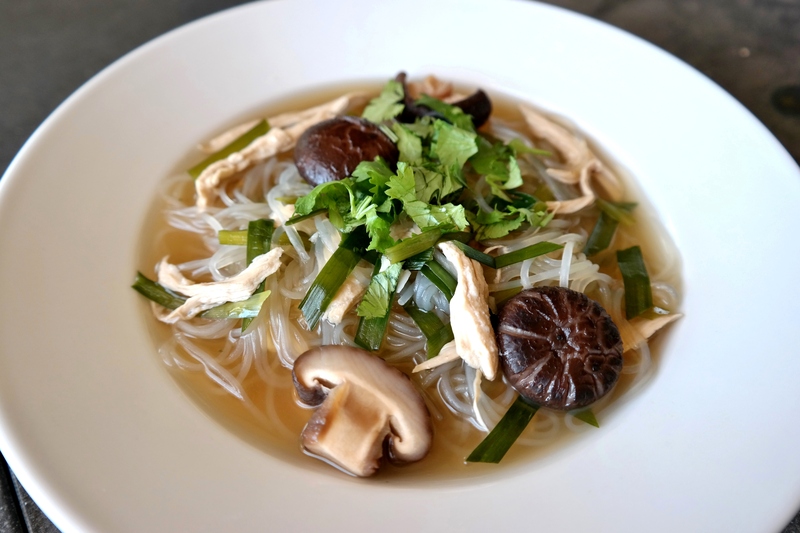 · Heat stock to medium high, add softened bean thread noodles and cook until they are translucent. Season with soy sauce and fish sauce to taste (about a tablespoon per quart). Add garlic chives and chicken. Simmer for a couple more minutes and season with salt and pepper. · Serve and garnish with chopped cilantro.